Officially the museum for A.H. Tammsaare was opened on 30th January 1958 in the house which was built by the writer's brother, August. Until 1972 the exhibition was located only on the second floor of the house. In 1978 on the 29th of January, in order to commemorate the 100th birthday of A.H. Tammsaare, a set of reconstructed buildings were opened. Replicas of a former barn-dwelling, barn, crofters dwellings, and fences were built. Hiking trails in the bogs surrounding the farm were also created. On the 4th of December 2002 a foundation for The Museum of A.H. Tammsaare in Vargamäe was created. 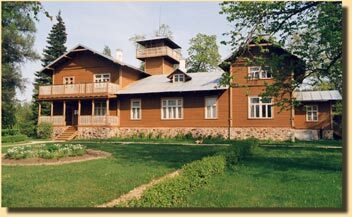 Anton Hansen Tammsaare Memorial Museum is situated in a summer-cottage-type house in Kadriorg, formerly a suburb. The Estonian literary classic Anton Hansen Tammsaare (1878-1940) lived in this apartment in 1932-1940 and died here. His widow Käthe Hansen wished their home to become a museum and her wish was granted on the centenary of the writer, on 30 January 1978. The first floor of the building contains the five-room apartment, furnished as it used to be in the writer's lifetime. In the other wing of the floor there is the literary-historical display of Tammsaare's life and work. The museum collection contains over 6000 items, among them rarities like the writer's death mask and his violin, his home archive with manuscripts, correspondence, documents and photos. In November 2005 a long-awaited redecoration of the exhibition hall began and we do hope to complete it and open the new exhibition by the end of 2006. Up to then only the apartment is open but smaller exhibitions are arranged in it, too. At the end of the 19th century the house and real estate at 9 Sepa Street (later 7 Vallimaa St.) belonged to a gardener Johann Brenner (1834-92). After his death the real estate was bought buy a tradesman from Kuressaare Jakob Aavik (father of Joosep Aavik) for his brother Mihkel Aavik (father of Johannes Aavik). On April 1, 1896 Mihkel Aavik moved in with his wife Ann (1849-1918) and their children Aadu, Liisi and Juuli. Johannes Aavik lived in his parents' house as a pupil in1898-1902 and later, when he worked as a teacher of Estonian in Saaremaa Gymnasium in 1919-1926. After the parents' death sisters Liisi (1885-1949) and Juuli (1890-1959) took care of the house. From 1961 till his death in 1989 the house was Joosep Aavik's home. 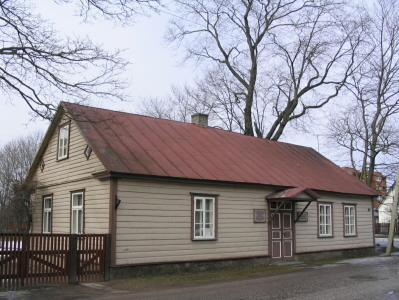 On June 19, 1992 the house was opened as Johannes and Joosep Aavik's Memorial Museum, being a branch of Saaremaa Museum. On the first floor of the building with unique architecture an exposition introducing the life of the artist and a dining room are located. The artist’s studio, working and sleeping rooms with personal belongings and ethnographic antiquities are upstairs. A park rich in various tree species that was planted by the artist and is under nature protection surrounds the house. A summer cottage and the artist’s grave are located in the park. Suur Toll is the only pre-war steam ship of the Republic of Estonia remained up to now and, at the same time, the biggest icebreaker in the world preserved through two world wars. In 1914 the first home port of the ship was Tallinn. In March 1918, armed Finns captured this ship from Russian Bolsheviks by agreement with the ship officers of Estonian origin. During the hard initial period of the Estonian Liberation War, Suur Toll (Wäinämöinen) was bringing to us volunteers and supplies. Proceeding from the terms of the Estonian-Russian Peace Treaty of 1920, the Finnish Government transferred the icebreaker to Estonia on 30 November 1922. The ship was named Suur Toll, and it ensured a regular winter sea navigation for Tallinn up to the end of the independency period. Only in October 1988, one succeeded to get back the ship taken by the Baltic Fleet of the USSR in 1941 and convert it into a museum ship. All the 3 original steam engines as well as most of the original arrangement of space and late Jugendstil interior of the officers’ rooms were preserved. „Seldom have I seen a place as picturesque as Kurgja. It is in the midst of woods, on both banks of the Pärnu River…“ C. R. Jakobson wrote to his betrothed in 1874. With the establishment of a farm at Kurgja he wished to become an example and a teacher for the other farmers. Farm buildings were constructed on the basis of his designs, thus being unique. In the period 1875–1880 the sauna, hive house, watermill and a cattle barn were built. The residential building with an interesting architectural solution was completed only after master’s death. By today the buildings have been renovated and furnished. The 82.5 ha Kurgja-Linnutaja is a functioning farm where cattle are bred and grain is cropped. Carl Robert Jakobson (1841-1882) was the first Estonian learned farmer, a politician, a mentor and one of the most beloved leaders of the Estonian national movement. A visit to the oldest building preserved in the Old Town of Tallinn is worthwhile. The Monastery, which once used to be a place where different cultures mingled and a cradle of Estonian schooling, is today a unique architectural monument for the whole of Northern Europe. The Monastery founded by Dominican monks as early as in 1246 and built in the Gothic style, offers besides medieval architecture a large collection of carved stones. There is a windmill at the gate of Eemu Farm in Linnuse Village on island of Muhu. It is one of the few functioning windmills in Estonia. Since May 17, 1980 it is a department of Saaremaa Museum. It is situated one kilometre from the Straight Väike Väin and it was built up on its old site by Jüri Ling, who lives in the same village. The Estonian Museum of Natural History is a state institution in the area of government of the Ministry of the Environment and has the status of a national museum. Having been founded as the Provincial Museum of the Estonian Literary Society in 1842, it has been operating as an independent museum since 1941. The Museum of Natural History operates pursuant to the Museums Act passed in 1996 (RT (State Gazette) 1996, 83, 1487) and the Statutes of the Estonian Museum of Natural History (Regulation No. 57 of 29 July 2005 of the Minister of Environment). The museum is housed in two buildings. The building at Lai Street 29A houses the exhibition halls, storage rooms for geological collections, the photo collection and office rooms of both the administration and the departments of geology and nature education. The building at Toompuiestee 26 is the location of the remaining collections and office rooms of the departments of botany, entomology and zoology. The total space at the disposal of the museum amounts to appr. 1000 m2. The further development of the museum will greatly depend on the amount of space available to the museum. We envisage the future of the museum in considerably more spacious premises, where the visitor can obtain a much more complete overview of the diversity of Estonia's natural wealth, where attractive exhibitions of environmental protection, general biological issues, world nature, etc. would be housed, and where it would be possible to create conditions also for the disabled, as these conditions are currently not in place in the museum. All ships are assembled in the historical Seaplane harbour which has become the homeport of our museum ships. In the course of years the Estonian Maritime Museum has acquired a number of historical ships whose value of memorial pieces is growing with the years. From the autumn of 2004 all ships were assembled in the historical Seaplane harbour (built in 1916) which has become the homeport of our museum ships and the place for our open air exposition in the future. Full development of Museum ships port with creation of the open air exposition among the existing historical constructions - hangars for seaplanes, barracks and headquarters building – is the large-scale project for the coming years contributing considerably to the value of the waterfront of Tallinn on its completion. Operations of the museum are focused on the preservation and introduction of the narrow-gauge railway for transporting supplies that functioned in 1896–1975 and the history of military and industrial railways. Every Saturday functioning exhibits are demonstrated on a special siding. The expositions displayed in old renovated manor outbuildings introduce the farming habits of Estonian peasants, sowing, harvesting, cattle breeding, flax growing, apiculture, development of technology. We organise exhibition-fairs, family days, receptions for bridal couples, programmes basing on folk games and different activities offering first-hand experience of the past, be it woodcarving, flax pulling and processing, threshing or making flour. The guests tired of city nose can rest in a tiny manor park. Schoolchildren can have fun on the swing. Sports Museum of Estonia is the central museum of Estonian sports, sport culture and sport history. Sports Museum of Estonia is one of the biggest sports museums of the Nordic countries and Baltic States. The aim of the museum is to collect, preserve, study and introduce materials related to the history of Estonian athletics and sport. Today the museum acts as a diverse cultural centre, which organises exhibitions, seminars, conferences, publishes materials and organises activities for children. Today’s Sports Museum functions as a versatile centre of culture. The interactive permanent display “Hortus Athleticus” provides opportunities for self-education and entertainment to the most different target groups – from toddlers and tourists to serious sports fans. In addition, the museum also organises seminars, conferences, art exhibitions and various children’s activities and issues publications. Estonian Theatre and Music Museum collects, preserves, studies and introduces the Estonian theatre and musicale life. The museum organizes exhibitions, concerts and discussion evenings. In the summer time some museum events take place in the small courtyard of Assauwe. Estonian Health Care Museum was established in 1921, and the museum was opened at the initiative of the doctors of the Tartu University in 1924. The basis for the many-sided activities of EHCM was mainly the enthusiasm of doctor Sumberg, the manager of the museum, and his skill to organise the best doctors to work for the museum. The museum had scientific committees that were responsible for expanding and developing of the display. In addition to the permanent display the museum also organised exhibitions throughout the country. In 1928 a department of the museum was established in Tallinn, which was opened in 1932. In 1950s the museum was closed. The exhibits were destroyed in a vandalistic manner. Waxwork was melted, copper items were sold as scrap metal. Some exhibits were simply stolen. The museum was reopened on the premises of Tallinn Medical School in 1980.From 1989 Estonian Health Care Museum is located in Lai street. Estonian Health Care Museum collects materials relating to the history of medicine in Estonia (photographs, publications, documents, various objects). Since its opening, the museum has been different from a traditional museum, which deal mostly with collecting and displaying of old items. An important feature of the work of the museum is human studies and educating the visitors regarding healthy life style. This is being done with the help of modern moulages, interactive exhibits and topical exhibitions. Apart from the permanent exhibition other exhibitions are organised. These include history of medicine, medical equipment, technical equipment for disabled people and also art exhibitions. From 2000 the museum employs an educational specialist whose lectures help the visitors to understand the exhibits better and who is able to deliver lectures on various topics: anatomy, evolution, first aid, drug abuse, venereal diseases, etc. It is also possible to see videos on the said topics.